I was never able to return to the crater until four years later in 2002. This was a defining trip for an infant Gigsville. For many of us this was a trip where we found "Our Voice." Now, certainly many of us had been involved in jackassery for years...from Burning Man to other various excursions, but this time we were just starting to come together as a community. 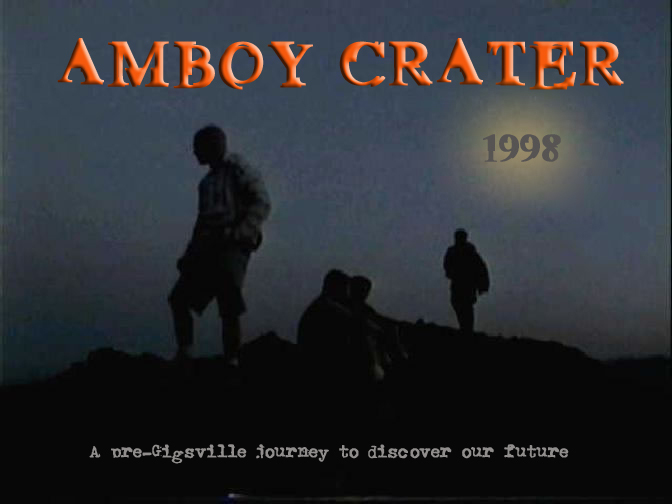 Amboy crater is a remote dead volcano in Death Valley, California and was naturally the perfect location to live out our artfully dangerous deeds far from the eyes of the world...and as it turned out...from their help as well. The trip was beset with mishap from the beginning. Before we even got to the crater my left rear tire exploded on Rt. 10 nearly getting us killed. Throughout the night similar forces came to visit us in the form of burns, Trey inhaling fuel, XTC nearly passing out and ultimately Trey's vehicle bottoming out on the way out...which thwarted our plans of escaping before the temperatures reached the 130 mark. In other words...it was a perfect trip.